Most spider bites cause local pain, redness and swelling. It's much like a bee sting reaction. A few spiders (such as the Black Widow) can cause a more severe reaction. Most spiders have tiny fangs. They inject venom into the skin. A shiny, jet-black spider with long legs (total size 1 inch or 25 mm). A red (or orange) hourglass-shaped marking on its under-side. Causes immediate local pain and swelling. Sometimes, you can see 2 fang marks at the bite site. Severe muscle cramps (especially stomach cramps) occur within 1 to 6 hours. These last 24 to 48 hours. Rarely causes death. Exception: bitten by several spiders or small child is bitten. Note: many are dry bites because the fangs are small. 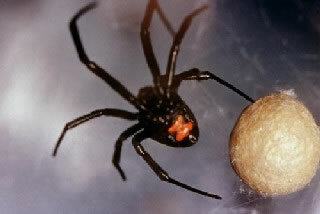 The brown widow spider is related to the black widow. It is found in southern US. Brown widow spider bites are treated the same as black widow bites. A brown spider with long legs (total size ½ inch or 12 mm). A dark violin shaped marking on top of its head. Causes pain at the bite. Blisters form within 4 to 8 hours. The center becomes bluish and depressed (crater-like) over 2 to 3 days. Skin damage may require skin grafting in 10% of cases. Other symptoms such as fever, vomiting, muscle pain can occur. No life-threatening symptoms occur. Brown recluse spiders are hard to identify. If you can, bring the spider along in a jar. More than 50 spiders in the U.S. have venom. Their bites cause reactions that are not serious. This includes pain or redness at the bite site. The bites are painful and swollen. This lasts for 1 or 2 days. They can feel and look like a bee sting. Some single, unexplained, tender bites that occur during the night are due to spiders. New redness starts more than 24 hours after the bite. Note: any redness in the first 24 hours is due to venom. Most spider bites look and feel like a bee sting. Wash the bite well with soap and water. Put it on the bite for 20 minutes. The swelling and pain lasts for 1 to 2 days. It should not be any worse than a bee sting. The black widow is shiny and black, with long legs (total width 1 inch). A red (or orange) hourglass-shaped marking may be on its underside. However, this marking is not present in all Lactrodectus species. 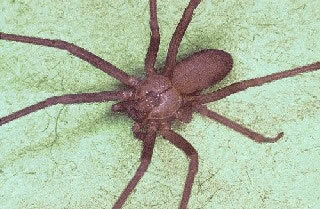 This is a photo of the Brown Recluse Spider (Loxosceles reclusa). It is a brown spider with long legs (total width 1/2 inch). There is a characteristic violin-shaped marking is visible on back.